While listening to the Waterloo Control Tower feed, do not expect constant transmissions. During poor weather, high winds, and during the winter months, traffic volumes will decline. Recreational and training aircraft will be restricted with visibility reported at less than 3 miles, and a ceiling of less than 1000 feet. Traditionally, January and February record the lowest traffic volumes. During the summer, complete frequency saturation is not uncommon. Total air traffic movements for 2016 were approximately 104,000 (up 3% from the previous year), the bulk of which are light recreational and training aircraft. With the longest runway at 7000 feet, the airport easily accommodates all manner of business class executive jets, and scheduled Westjet Boeing 737 traffic. Below is an aerial map that may help to visualize the flow of traffic. The yellow dots depict the path of an aircraft flying a typical "left hand circuit to Runway 26". Each leg of the circuit has a label and these labels, 'left downwind', 'left base' etc. are routinely heard as aircraft report their position, and controllers instruct aircraft on how to approach the airport for a landing . 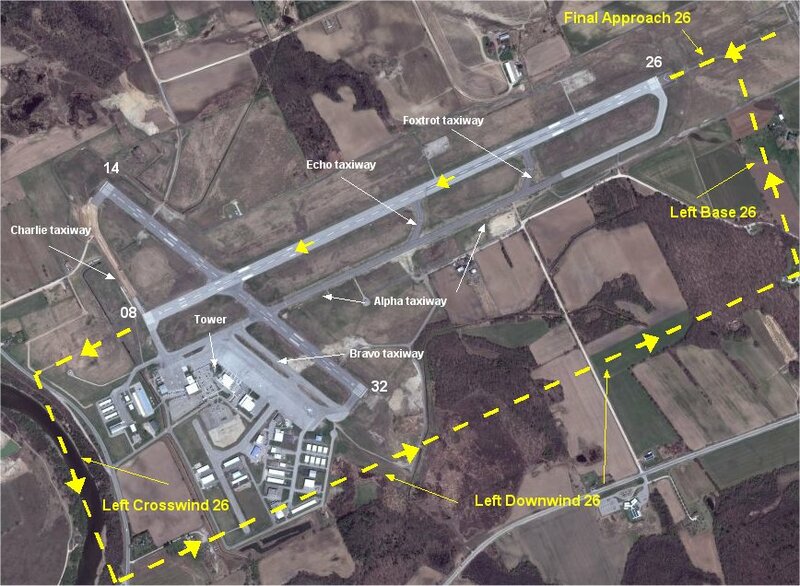 There is also a right hand circuit for runway 26 (not labeled), and identical patterns when other runways are in use. 118.55 MHz Tower Control Air Traffic Control Tower Frequency - Secondary. Airport maintenance (Regional EDACS Talkgroup frequency) which includes snow removal, runway maintenance, and other duties, is added to the audio stream during the winter months.